More complicated computer numerical controlled (CNC) metal spinners involve complex control systems and a larger variety of spinning tools. Regardless of the complexity of the equipment, though, the basic working concept of metal spinning is always the same. Metal Spinners – Acme Metal Spinning Inc. 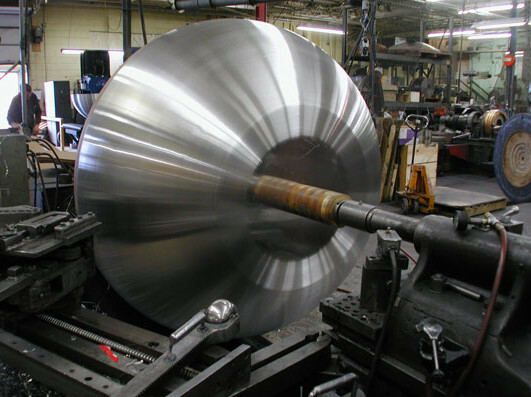 The metal spinning process involves rotating a metal disc, which is called a blank, at very high speeds while pressure is applied to it by shaping tools, which are called spoons. This pressure can be applied by a single tool or by multiple levers hydraulically. In the case of manual metal spinning, spinning tools are usually rollers mounted on hinged arms that are forced against the blank by hand. In the case of CNC spinning, automated rollers perform programmed movements with the help of precise mechanical equipment. The finished product, if produced correctly, will have no wrinkling or warble due to the high speed of rotation. The process is quick and cost-effective and produces metal shapes of high quality and excellent durability. Metal spinning continues to gain popularity as it becomes more economical. The advent of CNC metal spinners has allowed for quicker, more consistent production of metal products in large volumes. Integration of CNC spinners also reduces labor costs and makes employee injuries less likely. CNC spinners can produce shaped metal products in stock quantities as well as custom product runs. Currently, the majority of shops that perform metal spinning services offer custom metal spinning. Metal spinners can be used to create all kinds of simple industrial utilities, but the process is also widely used in the formation of specialized, complex decorative products like candle holders and vases. Because of flexible rapid tooling and the short set up times associated with the metal spinning, its cost can be much lower than other metalworking processes. Metal spinning can be used to shape all kinds of metals, including aluminum, brass, copper, hastelloy, and titanium. Metal spinning is a cold working process, which means that it is performed at or near room temperature. For this reason, metal spinning produces metal products with excellent qualities of strength and durability. Metal Spinners Metal spinners are metalworking tools used to create axially symmetric, round metal shapes. A metal spinning system, in its most basic form, can be as simple as a lathe, a mandrel and some spinning tools.